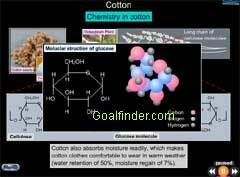 Educational science animation " Cotton " : Cotton is derived from Gossypium. Cotton is cellulose fiber. Chemically Cotton is cellulose polymer made up glucose molecules. Structurally cotton fiber has fibril and microfibrils and cellulose that give it various physical properties. This K8 –K12 animated chemistry topic gives in-depth information about cotton and is very useful for teachers and students both. Why are cotton clothes more comfortable to wear in summer? and O (oxygen) are bounded together by covalent bonds (chemical bond). All about it inside the animation.